The Berejiklian Government has unveiled a vision for regional fast rail in New South Wales, appointing the UK's High-Speed Rail 2 advisor, Professor Andrew McNaughton, to lead an expert panel and provide advice to the Premier and Deputy Premier on how high-speed rail might connect the state. a Northern corridor connecting Port Macquarie, Newcastle and the Central Coast. a Southern coastal corridor connecting Wollongong and Nowra. a Southern inland corridor connecting Goulburn and Canberra. a Western corridor through the great divide connecting Lithgow, Bathurst and Orange. The panel that Andrew McNaughton will head will identify regional growth opportunities and provide a strategy to the NSW government on how it may deliver the network over time. 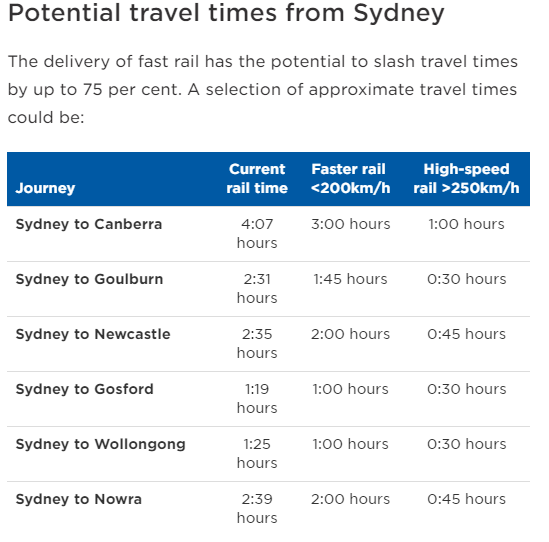 Long-distance fast and high-speed rail studies have been undertaken in Australia over many years. These studies have usually focused on linking the major Eastern Seaboard cities of Sydney, Brisbane, Canberra and Melbourne. These studies focused on rail as a competitor to air and road transport options. Most of the studies found that the costs and required ticket prices of an interstate high-speed rail network would be insurmountably high compared to likely customer volumes. Two possible infrastructure roll-out timeframes have also been nominated with a medium-term focus on upgrading existing corridors - straightening track, possibly building new track - along with rolling stock upgrades that might enable trains to travel up to 200kph. The medium-long term focus is on building dedicated corridors for even faster travels potentially travelling in the realm of 250kph. Somewhat echoing Victorian Premier Daniel Andrews when his government unveiled the Suburban Rail Loop pre-election proposal, Gladys Berejiklian said "I can give you this assurance: we will be starting in the next term of government. It might take us many years to get us to the network we want to build", as reported in the Sydney Morning Herald. The high-speed network strategy will also provide advice on funding options, including a blueprint for staging and 'each funding option considered as part of the strategy will be assessed based on the estimated cost of the project in light of economic and other benefits to the community, and complementary revenue-generating opportunities'. The strategy will be completed in 2019, assuming the Berejiklian Government is re-elected at the state's March 2019 election.